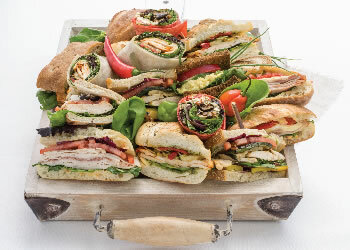 Sandwich Catering Essentials: What Makes a Great Sandwich? Putting together a sandwich seems simple enough. It’s a task that most Toronto workers do a few times a week to bring an easy lunch to the office or prepare a packed lunch for their children. Sandwiches can pack a mouthful of essential nutrients, vitamins, and minerals into just one bite. And for many busy modern people constantly on the go, they’re pretty much the greatest thing “since sliced bread.” Still, unless you’re a gourmet sandwich expert, there’s usually something missing in homemade sandwiches that makes us dread opening our bagged lunches to discover yet another Swiss and baloney or peanut butter and jelly. What are those essential ingredients that transform good sandwiches into great ones? The event catering experts here at Pumpernickel’s sandwich catering have been in the sandwich-making business for decades, and know a thing or two about the difference between mediocrity and excellence. Bread - The best sandwich bread has to support whatever toppings will be put in between its delicious slices. Of course, sturdy deli meats won’t need as much support as egg salad or peanut butter and jelly, but regardless, too-thin or flimsy bread is better suited to our breakfast toast than to a sandwich. 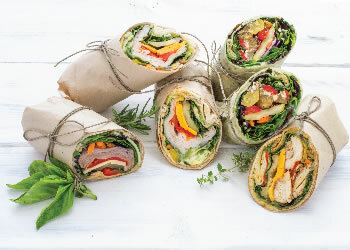 For the health-conscious, stick to whole wheat or multigrain slices, wraps, or pitas while delectable ciabatta rolls or baguettes are perfect for high-end delight. Main Topping - Choose which ingredient you want to be the focus of the sandwich, the topping that will satisfy your cravings and stop your hunger in its tracks. This could be juicy roast beef, smoked turkey breast, grilled chicken, Black Forest ham, eggplant, Portobello mushroom, falafel, smoked salmon, egg salad – the list is as boundless as your imagination and your deli section. Secondary Ingredients - Once you’ve decided upon a main ingredient, choose toppings that you love or will complement its flavour. These toppings add texture, contrast, and colour to your sandwich and, although they are secondary, they should never be just an afterthought. Crispy bacon, crunchy lettuce or baby spinach, juicy tomatoes, crisp cucumbers, pickles, sprouts, a variety of grilled vegetables, avocado, and any variety of cheeses round out the edges and give the sandwich bulk. It can be tempting to add a metric ton of delicious fixings to your sandwich, but just remember to start with a thick, stable bread to retain the integrity of your sandwich. Spread - A delicious spread seals the deal on a tasty sandwich. Whether you enjoy plain, low-fat, or flavoured mayo, honey-Dijon or spicy mustard, pesto, hummus, or just classic butter, the spread acts as a barrier between the bread and the toppings in between, ensuring that your sandwich doesn’t get soggy in the hours before lunch and adding its own flavour and texture to the culinary cornucopia that is a sandwich. Fixing up a sandwich can be a very personal choice. At Pumpernickel’s sandwich catering, we serve up make-your-own sandwich and wrap platters that allow you to customize your sandwich to your own personal perfection. 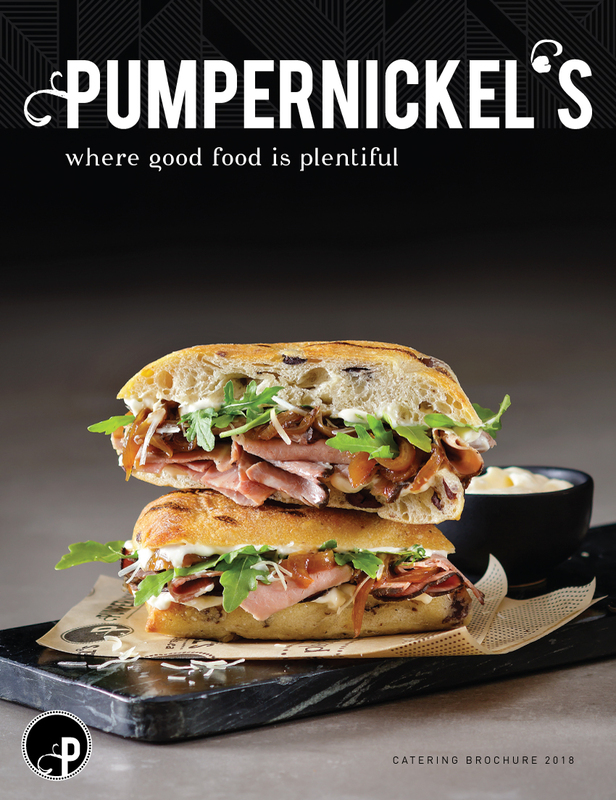 Our selection of gourmet sandwiches, which includes several tasty vegetarian options, is Pumpernickel’s crowning glory of sandwich-making craftsmanship. Sample our fresh ingredients and delicious inventions by calling Pumpernickel’s for your business catering and event catering needs.